The Get Down Rope with steel ring attaches to the fiador knot loops of a rope halter by threading the rope through the loops and back through the ring. The rope is then taken along the side of the horse to the saddle, looped up and secured to the saddle with either a tie or mecate rein holder. Alternatively it can be looped and tucked into the riders belt, remembering to tuck upwards from bottom to top for safety reasons. When you dismount you have the rope to lead your horse without having to use the reins. 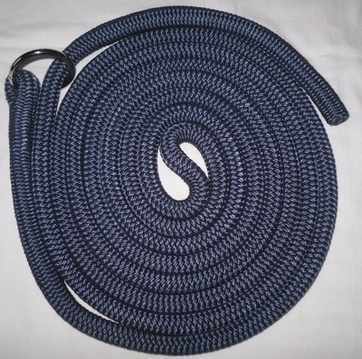 Similar to the 12ft part of the 22ft mecate reins, but the Get Down Rope allows you to use separate reins and also a bitted bridle.